Published: Nov. 5, 2007 at 06:28 p.m.
Week 9 had something for just about everybody. We saw individual records broken, team records broken and perhaps the most hyped regular-season game ever living up to its billing. The day started with a kickoff return TD by Leon Washington 13 seconds into the Redskins-Jets game, and it ended with one of the most bizarre plays I've ever seen -- Dallas Jason Witten catching a pass over the middle, losing his helmet and continuing another 30 yards without his helmet. The 53-yard reception was a career long for him. Adrian Peterson can look forward to a big payday down the road thanks to his phenomenal rookie accomplishments. But perhaps the most bizarre aspect of Week 9: there were three onside kicks attempted in the first quarter of games yesterday. For the record, the Saints recovered their onside attempt while the Redskins and Lions did not -- but all three teams ended up winning. By now you know that Vikings rookie Adrian Peterson set a new single-game rushing record with 296 yards against San Diego. 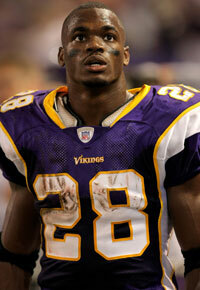 What you may not know is that Peterson earned himself an extra $2 million. The seventh overall pick had already reached a few incentives in his contract, and topping the 1,000-yard mark for the season adds $2 million to his base salary in 2011. It's not a big surprise that Peterson reached 1,000 yards -- it's how fast he did it that raises eyebrows. Along with his rushing total and three TDs, Peterson added a 19-yard reception. The 315 yards from scrimmage is the third-best total of all-time and second highest for a running back (only Flipper Anderson and Billy Cannon have had more). Peterson rushed for more yards in the second half -- 253 -- than any back has rushed for in an entire game this season. It was also more than the previous rookie record for an entire game (251 by Mike Anderson of Denver in 2000). This was Peterson's second 200-yard game; no rookie had ever topped 200 yards more than once. On top of all that, Peterson accomplished this feat against a Chargers defense that was allowing an average of 88.9 rushing yards per game and had given up just two rushing TDs all season. In their 48-year history, nobody has ever run for 200 yards against them (the previous high was 181 by Priest Holmes in 2001). Peterson is on pace to break the single-season records for rushing both by a rookie and overall -- records held by Eric Dickerson. Ironically, Peterson reminds me of another running back who played for the Vikings, albeit a player who didn't come to Minnesota until he was past his prime: Herschel Walker. Like Walker, Peterson is a player who thrives on carries. He can take a little while to get going, but the more he gets the ball the more explosive he gets. In his seven-year, 90-game pro career, Lions defensive tackle Shaun Rogers has blocked more kicks than any other NFL player. On Sunday, he recorded his first NFL interception and returned it 66 yards for a touchdown. While official records are not kept on this stat, he might be the heaviest player ever to score a touchdown on an interception return. His weight is listed at 340, which looks to be about 20 pounds lighter than what it really is. On his TD return, Denver rookie and fellow Texas alum Selvin Young caught up with Rogers, and the 207-pound Young was swatted away as Rogers continued his TD gallop. Dating to 1953, the Colts never had a player gain 100 yards rushing and 100 yards receiving in the same game. Joseph Addai did it yesterday against the Patriots, finishing with 226 yards from scrimmage. But as impressive as that was, keep in mind that much of that yardage came in the first half. Credit the New England defense with adjusting at halftime. The Patriots had been going with six defensive backs early on to combat the Indianapolis passing attack, but when they switched back to a more consistent four-man front in second half, it made a big difference. In particular, Richard Seymour up front and Rodney Harrison at safety played very well. Patriots QB Tom Brady became the first player in NFL history to pass for three or more TDs in nine consecutive games, breaking the record he had shared with Peyton Manning. The win also gave the combination of Brady and Bill Belichick a record of 79-24. The winning percentage of 76.6 puts Belichick/Brady ahead of Peyton Manning/Tony Dungy (67-21, 76.1) for the best winning percentage for a QB/coach combination. New England wide receiver Wes Welker had a number of big plays in Sunday's game. The two that stand out are the fourth-quarter touchdown catch on a third down that brought the Patriots to within 20-17, and the third-down catch to give New England a first down with time running out that allowed them to run out the clock. Not bad for a guy who went undrafted out of Texas Tech in 2004. Most people know that Welker established himself as a kickoff and punt return specialist with Miami the last couple of seasons, but his NFL career actually began when he signed out of college with San Diego (the Chargers waived him after one game). After nine games this season, Welker has 61 receptions and seven touchdowns. He had one TD catch in his first three seasons. The Dallas Cowboys are 7-1 for the 10th time in franchise history. The previous nine times, Dallas finished with a minimum of 11 wins and made the playoffs all nine times, and won the Super Bowl three times. ... Dallas scored 38 points Sunday night, the most they've scored against the Eagles since 1971, when they scored 42. ... Saints QB Drew Brees passed for 445 yards and three TDs vs. Jacksonville. It was the second-highest yardage total in Brees' career (he had 510 last year vs. Cincinnati). Brees had one TD and nine INTs in the Saints' first four games, all losses. He's had 11 TDs and one INT in the last four, all wins. And his passer rating has increased from 57.4 after four games to 84.6 now. ... At the halfway point, five teams have won as many or more games than they did the entire 2006 season -- Cleveland (5), Detroit (6), Oakland (2), Tampa Bay (5) and Washington (5). ... Seven of the eight division leaders through eight games last season went on to make the playoffs. The only one that didn't was Denver; the Broncos led the AFC West with a 6-2 mark but failed to make playoffs when they lost the final game of the season to San Francisco in overtime.